Julie has been a student of textiles for most of her life, exploring colour, design, ornamentation, techniques and media. Part time work has enabled her to attend a multitude of courses, none of which led directly to quilting, but in 1998 she leapt into quilt making. This journey into quilt making has been the highlight of her creative pursuits and she feels very comfortable with what she does.A fine arts training, majoring in drawing and painting and many years employed teaching high school students art, craft and design has kept Julie within creative contexts. So much of Julie's paid work has been giving out, nurturing and engendering the creative expression of others; Now through quilting that frustration to express herself has finally been addressed. Having grown up in a creative family and lived in an artistic environment all her life, it seems that the burning desire to communicate and express aesthetically had been ‘smoldering’. Writing was one outlet that came naturally and she has recorded many significant life events in word; A book lurks in a time when her family commitments reduce (if ever) and it will be a quilt book. At a time in her life when poor health challenged continually, a school colleague loaned her Robyn Ginns’ Book; ‘That Quilt has a Story.’ She enrolled in Robyn's class of needle turn appliqué and doors flew open. Quilting was not only just a pattern to be followed!As a child Julie was creative, energetic, untidy, cheeky and non-conforming. A tomboy, always busy making / inventing things, anything arty and lots of things on her hand turned antiquated sewing machine. Nothing was made from a pattern except clothes and often then, the resemblance to the original was slight. Teaching, home making, interior decorating, gardening, stained glass and renovating old houses provided projects to satiate her need to create and of course, provided endless satisfaction and joy . Julie has been a person who does not use the word ‘bored’, as time is always finite. In expressing frustrations to an artist/ teacher friend about ‘finding time’, he tells me to learn to “sleep faster”. In the 1980’s Julie followed the work of Australian textile artists Heather Dorrough, Kaye Lawrence, Jenny Kee and Alvena Hall, being somewhat jealous of their opportunities to create in fabrics. The state and national Crafts Councils publications sustained her craft interests through an era when creating in textiles / fabrics were deemed lesser media, or at least, not ‘real good’ art. The debates of ‘Art versus Craft’ continue and she looks forward to a time when quilts; traditional and contemporary, command the same arts funding, audiences, profiles and prices that historically established, male dominated art forms attract. The lines separating contemporary textiles and painting have frayed / blurred and in her lifetime she hopes to see these terms of reference refuted. Perhaps Julies work may one day contribute.When Julie's daughter would no longer wear smocked dresses, she began needle turn appliqué. Ongoing health problems meant hours spent in clinics and doctors’ waiting rooms. One highlight was having bee sting desensitising. This provided weekly sessions where she had to sit very still for a couple of hours; perfect for reading and hand quilting and thinking. "Many times when poor health interferes with my life, it seems that a reason emerges, or an opportunity is created from that challenge. In that way I have been blessed." In dealing with chronic pain, she was training [quite unsuccessfully] to re direct her brain from registering pain, with number patterns and numerical distractions. Failing this and being a visual person who doodles and draws all the time, the doctor suggested doodling, patterning with a pencil. A weeny blank book accompanied her everywhere and when in pain, provided the focus of distraction, and much vigorous doodling. This led to rekindling her love of drawing and following some sketches in the garden, to her first stained glass quilt; “Iris in Favrile” in 1999. ‘Lemon in Favrile’, taken again from sketches from the lemon tree at the back door, was her successful entry into the exhibition, ‘’Australian Bounty”. By now, her life had irreversibly changed, as had that of her family. The formal dining room began to evolve into a studio [and anyway, who had time for dinner parties?] and the carport periodically doubled as the dye and print workshop. First the dining table was replaced by a table tennis table, later to be itself replaced by a purpose built work table along with various cupboards and walls of pin up space. Now, they are permanent fixtures, with the studio being the centre of the house. Her years of part time study seemed to link with quilting pursuits. Skills and ideas from lead light classes making windows for her house renovations, overlapped into textiles. Louis Comfort Tiffany, the famed American glass artist, and maker of opalescent ‘Favrile’ glass in his Tiffany studios influenced her, as did the work of English designer William Morris. Studies in textile dyeing, printing, embellishing and construction in the 1980’s has provided the know how for how she works today.Purchased quilting fabrics did not provide the diversity of cloth needed so she dyed and printed her own. Julie's evolving skills as a quilt artist come from a fine art, not a sewing background and this makes her work difficult to slot into the patch working traditions. Artists like David Hockney with his ‘Photographic montages of time and place, modernists like Mondrians’ abstracting, Picassos’ line drawings and Van Gogh’s colour have influenced her. Discovering a book about the secrets and symbols of flowers written by women of the Victorian era provided a language for some of the symbolism and meaning that lurks in every piece she makes. Layers of meaning, like the layers of cloth are hidden, to be peeled back as the viewer chooses. "Religious art and sacred imagery use layers of meaning; a language of colour, symbolism and messages familiar to me". She used this approach, incorporating colour, forms and floral symbolism into her third quilt ‘Women in my studio’ the AQIPP winning entry of 1999 [the first competition she’d entered]. One piece, a commissioned quilt for the 80th birthday of a very dear friend Betty, contains the thoughts and messages of her friends, represented by flowers that surround a cherry tree. Education, the centre of Betty’s life, is represented in the cherry tree, her faith, the dove with everlasting life as the butterfly. This image has since proven popular, [like the Iris quilt] and is sold as one of the quilt cards that she has published. Publishing patterns came as a surprise, at a time when she could not have been busier. Overseas interest in the Iris Quilt encouraged her to write the pattern, as it seemed it was destined to be copied. The market seemed flooded with overseas designs, so she began doing what she enjoys most; drawing, writing and creating. Patterns of smaller wall quilts and cushions have evolved and like all quilters, her head is full of ideas. Finding self promotion difficult, she leaves that business side to her husband, Peter. Julie's quilting has attracted interest for teaching too, so she began sharing her art and craft expertise with quilters. Four days a week teaching in high school leaves limited time for other jobs, but the holidays are great! Teaching adults has been a wonderful experience; satisfying in having students eager to learn and appreciative of her efforts. The opportunity to share, learn and mix with ‘like’ spirits has been a treat too. Discovering this worldwide network of artists, creators and lovers of textiles has been a real bonus for her. "Needless to say, I’m on a fast learning curve. 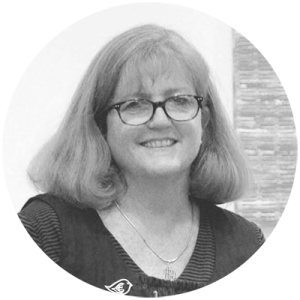 "Teaching with famous quilters at events like Federation Fling in Perth, Quilt Encounter in Adelaide, NZ Quilt Symposium in Christchurch and a huge variety of country and interstate workshops is a privilege for her. The environment was a cultural feast and she is delighted to teach not only fabric dyeing and printmaking, but drawing and designing for quilting. This is her passion. Technical expertise abounds in Australian quilt making and Julie sees opportunities to provide flexible art skills for quilters, both the traditional and contemporary. When her son in grade 7 was given the ‘25 hours a day’ award for fitting the most into every day, she suspected that he has some of her creative working genes, though when she looks into her fabric stash she fears that time will run out first for her.Julie's art is open ended. It changes and responds, expressing social, economic and political ideas as well as beauty and the mundane. She has designed stained glass windows for her church, made banners with youth groups, designed and stitched stoles for ministers that told ‘their’ story. Julie's quilts have been the centre piece for sermons, decorated churches and numerous places where they talk to people who don’t quilt. Her quilts are theme based such as; ‘Gloves off; the honeymoon is over’ (Dare to Differ Exhibition), Teddy’s Secret (a quilt about teddies views of child abuse) and her 2001 AQUIPP entry ‘Eliza to Claira; six generations of women’ depicted in art, architectural and design elements the history of women in my family since settlement.Following this, her work has focused on Australian native flora (with each Australian states’ flower emblem) and Australian Birds. The “snapshot view” like much of what we see on the internet, is a direction that her style is drawn to. She enjoys the surprise element of quilting, and in her and other’s work, and she loves to know - what’s next. Magazine purchases, one of her weaknesses, keeps her in touch with the bigger world and she hopes to travel and study further – overseas if possible one day. For the time being, she is a very content quilter. "If only I could learn to sleep faster!"